Home / Engagement rings: Custom Design / Round Diamond Rings / “Stellar” Round Brilliant cut diamond, 1.01ct. “Stellar” Round Brilliant cut diamond, 1.01ct. Channel set princess cut diamonds rise in a slightly concave profile band with a polished edge. The central setting is of four claw construction with spear point tips. 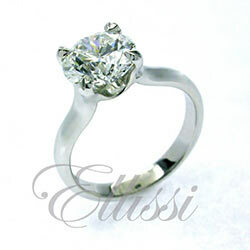 The feature diamond in this ring was a 1.01 ct D/VS2 round brilliant cut with “Excellent” cut. Shoulder diamond were selected to be E/F VS and consist of 6 diamonds on each side.